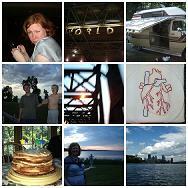 have *almost* finished uploading all of my old journal posts to wordpress. I just have to fix a couple of figure locations and then I’ll start deleting all the old pages, and then will move onto the crafts stuff and old photo archive pages. I want to get my blog all pretty and happy and sleek and trim and like a jungle cat, but it’s taking some time: I’m lazy, etc, and also when I first started this here blame thing in 2002 I was armed only with ms word, a general reluctance to buckle down and really learn html, and an ftp site. it was good for what I needed, but it was a hassle and a half. I heart wordpress, by the way. it is superduper. edited: done. have loaded all photos/etc up, fixed all links, etc. phew! it is so weird, by the way, to have a record going back almost 4 years of this kind of thing. I’ve never been so glad that I’m such a charming individual [ha!]. I’m very excited about this Chihuly installation at the NY Botanical Gardens — I wanted to go see his installation in chicago a few years ago but never got around to it. I saw a movie on pbs about his installation in venice and it amazed me, totally, and started me really thinking about glass. Now I have a bookmark folder of locations where I can learn to blow glass – if I had gotten a job in pittsburgh I would have been able to afford lessons at the pittsburgh glass center but that didn’t pan out, and I can’t find a place convenient to me in NJ yet. am still looking though!